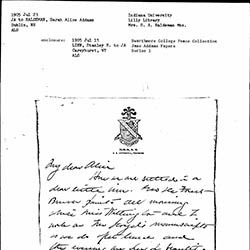 Addams reports on her stay in New Hampshire and work on the Lloyd manuscript. 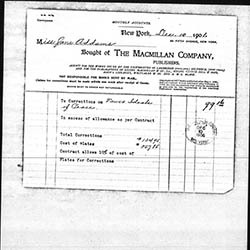 Credit statement from The Macmillan Company to Addams for her book. 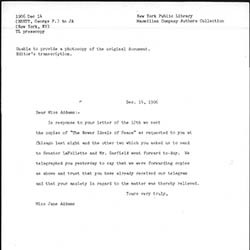 Page reminds Addams about his interest in publishing a book based on her autobiographical columns in the Ladies Home Journal. 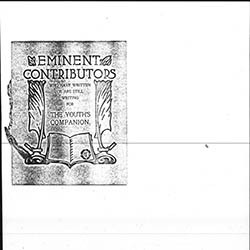 Pamphlet that contains the names of authors who have written and are still writing articles for publication in Youth's Companion. 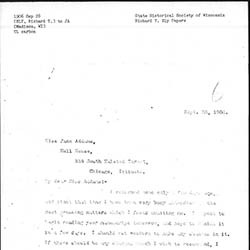 Bok, the Editor of Ladies' Home Journal, congratulates Addams on the success of her article and urges her not to hesitate to contact him if she needs help publishing her work. 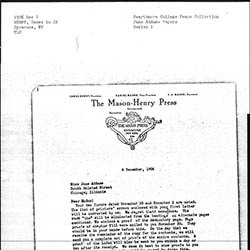 Crowell reminds Addams of their arrangement for the publishing of one of her works in the magazine Philanthropy and Social Progress. 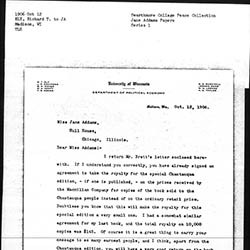 Addams declines Page's request to publish her essays, stating that she is too busy with the Chicago School Board and another book already promised for the Macmillan Company. The Macmillan Company details how many copies of Democracy and Social Ethics sold in various cities and countries. The Macmillan Company is framing Addams for libelous accusations against them and wishes her to publicly retract her statements. 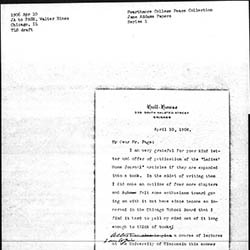 Addams informs her publisher that she has sent out a manuscript of her latest book to Ely for proofreading, but he will not return from a trip for several weeks. Addams would prefer that he give his input on the manuscript, but if Brett cannot wait that long, she will rush the process. 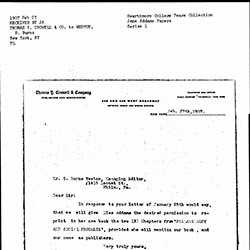 Johnson asks for permission to use a portrait of Addams in The Century Magazine. 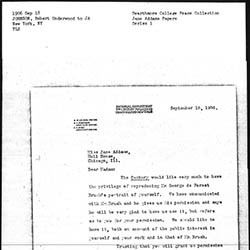 Ely has just returned home and assures Addams that he will proofread her manuscript for Newer Ideals of Peace. 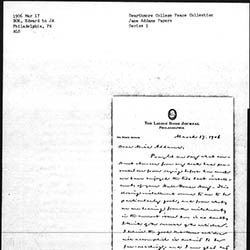 Brett writes on behalf of the Macmillan Company asking Addams when her manuscript for Newer Ideals of Peace will be ready to be published. 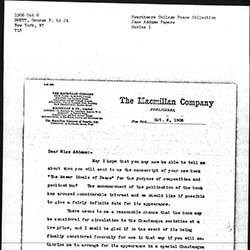 Addams writes to Ely about sending her manuscript for Newer Ideals of Peace in to The Macmillan Company, and summarizes for him a letter they sent her. 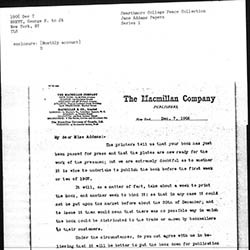 Addams replies to Brett of The Macmillan Company assuring the manuscript's near complete status, as well as some signed manuscripts. Brett informs Addams that her manuscript for The Newer Ideals of Peace is going straight to the printers for production. 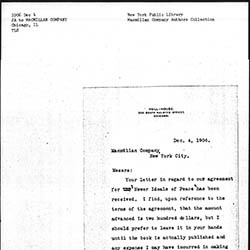 An agreement detailing that Addams will receive 13% of the price of the special Chautauqua edition of Newer Ideals of Peace. 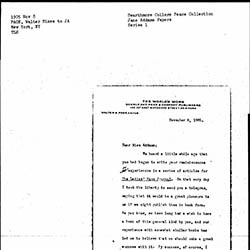 Ely writes to Addams upon finishing his proofreading of The Newer Ideals of Peace, and proceedes to tell her about his edits. 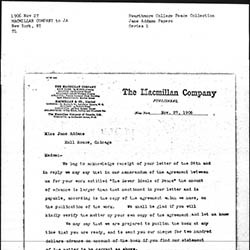 Addams reminds the Macmillan Company that she is due a check for $50.00 for delivering Newer Ideals of Peace. 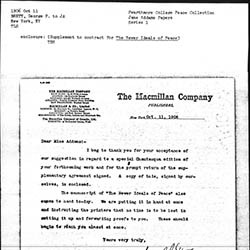 Macmillan indicates that their copy of the contract for Newer Ideals for Peace stipulates that payment will be made on publication of the manuscript, not submission, and that they are ready to publish it whenever Addams is ready. Addams notes that she expects a $200 advance on Newer Ideals of Peace but would prefer to receive it upon publication of the book, when all editing is completed. 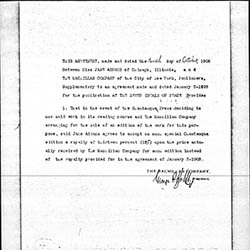 Henry responds to Addams list of corrections for Newer Ideals of Peace. 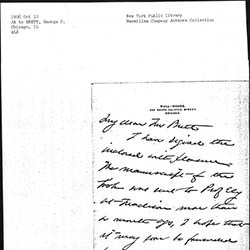 Brett notes that Newer Ideals of Peace can be published as early as December 20, but that they think it should be held to January; he encloses her advance check. 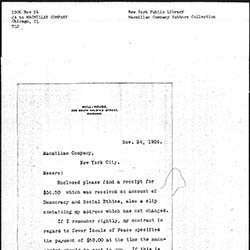 Statement of charges on corrections and plate costs for Newer Ideals of Peace. 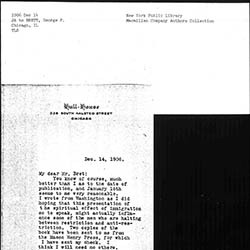 Addams agrees on a January 16 publication date for Newer Ideals of Peace and explains that she hoped to sway opinion on immigration with the book copies. 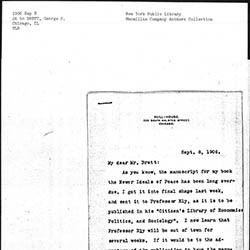 Brett confirms that they sent copies of Newer Ideals of Peace off to LaFollette and Garfield as Addams requested. 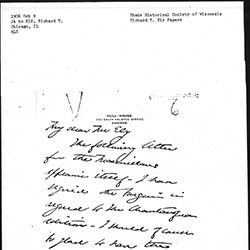 Brett thanks Addams for her receipt and list of names to send copies of Newer Ideals of Peace. Crowell grants Addams permission to reprint her two chapters from Philanthropy and Social Progress in her new book as long as she includes proper citation. 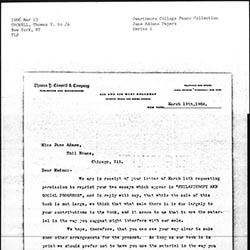 Marsh sends Addams a copy of Race and Immigrants in America by John R. Commons. 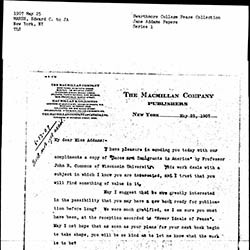 He also reports that the Macmillan Company is eager to publish Addams' third book after the success of Newer Ideals of Peace. 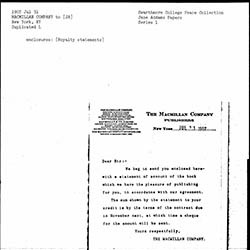 Macmillan Company sends Addams a statement for her royalty account.